Qingdao fun guide with a detailed Qingdao business hotels review, and old German quarter beer festivals, by Amy Fabris-Shi and Philippa Young, and more from Smart Travel Asia and Dancing Wolf Media. Facing the Yellow Sea, Qingdao, with the world’s largest condom factory, frothing German brewery, and Taoist pilgrimages, is more than a small contradiction. Our guide to yeast, feasts and Qingdao small corporate meetings for suits. I SPY with my little eye, something beginning with: German beer, abalone, Taoism, Communist beaches, and an Olympic sailing team. No, not Quentin Tarentino’s latest eccentric gangster flick, but Qingdao – one of China’s burgeoning second-tier cities – where you can enjoy all of the above, and beer in plastic bags. The “hajiu-soaked” (“hajiu” is beer in the Qingdao dialect, or “pijiu” in Mandarin) residents of Qingdao are famous for the German founded Tsingtao Brewery, from which a fresh, light lager frothily pours. Take a stroll round the museum and see the modern brewery in action, or step out onto Beer Street for a Rmb15 plastic bag (price by weight) filled from barrels outside grocery stores, laundries and restaurants. 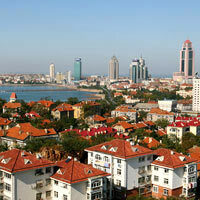 Qingdao came into the limelight during the 2008 Olympics as a serious sailing hub. This, and the growing International Beer Festival, brought a revamped airport and several international hotel offerings to the relatively small coastal city. English is not widely spoken outside of the five-star Qingdao business hotels, but a friendly populace and a bilingual concierge should be able to kit you out with all the Chinese characters you need to get by. Qingdao Liuting International Airport (www.qdairport.com) is approximately 23km from the city centre via efficient highways yielding impressive mountain views. The airport is small, modern and easy to zip through at either end. Follow the clear signposts to the taxi rank or airport shuttle buses. Exits are clearly marked by letter so it’s easy to find your driver if you are being picked up. Taxis into the city throng take between 45 minutes and an hour at a cost of Rmb60-Rmb80. There’s no need to haggle and the meter will always be on. Of course, it pays to be vigilant. Taxis start at Rmb9 (1.4/km) for regular air-conditioned taxis with a marginally higher price for larger cabs. Either way, a short taxi ride is unlikely to cost more than US$5. Shift change for all city taxis is between 5.30pm and 6pm, when flagging one down will be nigh on impossible. High-speed inter-city trains arrive and depart from Qingdao Railway Station, built by the Germans in 1901. The magnificent colonnaded and clock-towered icon with chandelier-strung waiting rooms presents a stark contrast to the futuristic 330kmh trains that whistle through it, linking Beijing in as little as four-and-a-half hours and Shanghai in just over six. Tickets can be bought at the station or through your hotel concierge. Train travel is very popular so it’s best to purchase your tickets at least a day or two ahead. 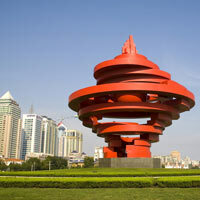 Choose your season wisely as Qingdao’s climate is quite extreme, as are its tourist seasons. Summer is hot humid and crowded as domestic travellers flock to cool off on the sandy beaches of one of China’s best-loved seaside destinations. Frosty winter temperatures can drop to below zero Celsius but corporate travellers enjoy better room rates and empty beaches. Hardy old Qingdao locals, known for their bracing winter swims, take it all in their stride. September and October see pleasant balmy days and cooler evenings. Money is routinely changed at hotels or banks (there are no money changers in China). The exchange rate is US$1 = Rmb6.21 and hotels generally provide a reasonable deal. Qingdao – historically known as Tsingtao – is regularly voted China’s most livable city on account of its natural scenery, beautiful coastline, fresh air and pleasant climate. The port city of five million urban dwellers sits on the south-facing coast of the Shandong peninsula surrounded by water on three sides. Japan and Korea lie a ferry ride across the Yellow Sea. 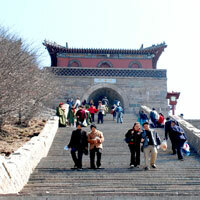 The city is also ringed by craggy mountains, topped by the soaring Laoshan, regarded as the birthplace of Taoism. Flying into the city you can spy the world’s longest sea bridge, Haiwan Bridge, connecting Qingdao to the offshore island of Huangdao across as incredible 26.4-mile span. 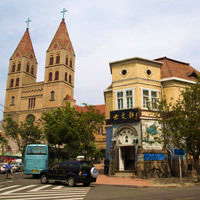 Qingdao’s strategically placed port and pretty coastline attracted the eye of German settlers, who occupied the fishing town in 1898 putting their architectural mark on the landscape in the many gabled villas, stone castles and pretty churches of the well-preserved heritage neighbourhoods. They also established the Germania Brewery in 1903, later known as the Tsingtao Brewery, which continues to produce China’s most widely sold suds. A distinct lack of cohesiveness is the most obvious element of Qingdao sightseeing, and nothing could be better. With no action hub, cheesy tourist traps have been avoided, and itineraries in this Qingdao fun guide can take in various points of interest while skirting the crowds. Starting in the eastern Laoshan District, verdant parks and Laoshan mountain draw hikers, Taoist pilgrims, and those seeking a less crowded version of Japan’s cherry blossom season (April-May). Believed to be the birthplace of Taoism, the majestic mount offers cool rock formations, waterfalls, religious sites and ocean views. At the southern slope of Laoshan, Shilaoren or ‘Old Stone Man’ is named after a rock formation shaped like a crotchety figure gazing out to sea. A themed Sightseeing Garden and Golf Club lead to the featured rock. This also marks the start of Qingdao’s Seashore Boardwalk that, upon completion, will stretch 40km to Tuandao in the west. Walk, cycle, or jump in a taxi as the beaches count down, six to one. Number One Bathing Beach at Huiquan Bay is 580m long, 40m wide, and considered the best. The other beaches shouldn’t be overlooked for quieter trips. Following the coastline west you’ll arrive at the Olympic Sailing Centre jutting into breezy Fushan Bay. Built to host the 2008 Olympic and Paralympic Sailing Regattas, the world-class venue on the site of a former shipyard is now a staging ground for international events, sailing classes and tour boat cruises. Its bars and cafes have become a popular local hangout. On the peninsula separating Taiping Bay and Huiquan Bay is Badaguan Scenic Area or “Eight Passes”, made up of tree-lined roads and Bavarian-style villas. The Gothic castle here overlooking Taiping Bay is a favourite spot for wedding photography. Hop on a tandem bike from the numerous rental kiosks dotted around the area to explore the crisscrossing passes and peer behind old stone walls at the beautiful historic residences. Thighs feeling the strain of pedalling up and down those hills? Pop into the Zai Shui Yi Fang Leisure Club, a bathing house offering spa, sauna and massage facilities. Unique to Qingdao, the bathing house offers “circling pure ocean water” for an entrance fee of Rmb88 men, Rmb68 women and Rmb38 children. Buy a disposable swimming suit if you’ve left yours at home and enjoy a pedicure for Rmb38, a full body massage for Rmb298 or even get your shirt laundered for a very reasonable Rmb20. 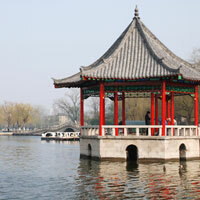 Head to the old town east of Zhongshan Park for more examples of German architecture. Some parts haven’t been touched since the Germans left, while others in the centre of town are enjoying a careful facelift. Walking around this area gives the uncanny feeling of being in a rural German town, with dark pine trees, chunky stone churches and red-tiled roofs. The old German and English embassies sit a five minute stroll from The Guest House, the ex-German Governor’s residence, lurid in yellows and reds, now housing independent hotel, The Castle Boutique Hotel. The Christian Church, Lutheran Church and Zhanqiao Pier in this area are also worth a quick visit – the pier was built in 1891 and its pavilion at the end of the 440m pier is the unmistakable symbol on all Tsingtao beer bottles. Lest it be forgotten in a drunken blur, the Tsingtao Beer Museum (tel: [86-532] 8383-3437, museum@tsingtao.com.cn) on Dengzhou Lu, commonly known as Beer Street, lies north of Zhongshan Park. With the tagline “give us an hour, we’ll give you a century”, for Rmb50, Tsingtao Beer Museum takes you through the history of the brewing process in China in Chinese and English. If English-speaking guides are on hand to entertain groups the experience is vastly more enjoyable. The final stop is a small glass of the famous “raw” beer and a pack of moreish beer nuts. In the museum shop, purchase jugs of beer and take-home bottles at Rmb10. The chocolate-y tasting stout is rarely found outside of the city. Qingdao dining options centre round locovore seafood and Shangdong cuisine, with smatterings of Korean, Japanese and Italian. When dining outside of the major hotels, one of the best Italians is tiny six-table Trattoria Verde (tel: [86-532] 8589-8530) at 100 Shanghang Lu. You’ll need to book in advance and Trattoria Verde is closed on Mondays, but if you can get a table in this intimate establishment, the food and service is worth it. For a quirky Korean meal, Nolboo Restaurant (tel: [86-532] 8801-1080) has a Rmb70 set menu and a Korean barbecue on the second floor. Nolboo is a little out of the way but one of the best Korean offerings in town. Eat with the fishes at oceanfront restaurant Yinhai Word close to the International Yacht Club, for all the seafood you can imagine, and some you can’t. Beer Street is also lined with seafood restaurants. Pick the busiest ones and don’t worry if you can’t read Chinese – many of the restaurants have pre-prepared versions of the dishes on display that you can simply point to, along with tanks of live seafood, buckets of shellfish and other sea creatures that they’ll fish out and prepare to order. Among the Qingdao seafood specialities are scallops, conch, clams, oysters and crab. Wash down your feast with fresh beer on tap. If it is an early morning caffeine hit you need, take yourself to Coffee and Tea Craft Street and browse the traditional Chinese teahouses or European-style coffee shops (Rmb20 for a cuppa). Perhaps a stiff drink is in order after all that shopping – roll into a bar on…Bar Street. The practically minded Qingdao city planners have thought of everything, and although the Chinese road names still exist, you’ll find these literal translations widely used. On Coffee and Tea Craft Street (Minjiang Er Lu), find Happy Day Coffee (tel: [86-532] 8597-1179, www.happydaycoffee.com, open 9.15am-2am) where you can sink into chintzy sofas and enjoy their healthy wine selection and hearty European and American meals for around Rmb58. Café Kona (tel: [86-632] 8573-5300) pours a good cup of coffee against a backdrop of heavy wooden furniture, a mezzanine floor and calm music. On Bar Street (Jianxi Lu) hop between Freeman Café with Mediterranean design touches and a relaxed atmosphere, ssLPG (short for Simon says let’s play games), SOHO, Charlie’s Bar, TJ’s and the popular Corner Jazz Bar. Slightly farther afield, but still in the entertainment district, is expat haunt Club New York (2/F, Overseas Chinese International Hotel, 41 Xiang Gang Middle Road, tel: [86-532] 8573-9199) known for its live music. Check out hidden gem Room Lounge (1/F, HaiHua Building, BinHai Garden 1 Shang Dong Road, tel: [86-532] 8666-3559) for Italian, French and Argentinean wines in an intimate and stylish space. This is a nice Qingdao bar for an evening’s unwind. While not a fashion and artist hive like Beijing or brand name bandwagon like Shanghai, Qingdao has seen Japanese and Korean influence and is drawing more big brands, as malls spring up around new hotels. Head to the Hong Kong Garden area for Qingdao’s mix of international entertainment, shopping, dining and nightlife, all within handy walking distance of several major hotels. The keen shopper can hop from Japanese supermarket Jusco to all-round department store MyKAL (tel: [86-532] 6670-0666); window shop high-end fashion at Hisense Plaza (tel: [86-532] 6678-8888, www.hisense.com) and Sunshine Plaza (tel: [86-532] 8667-7166), or browse the highbrow at four-storey Book City (tel: [86-532] 8587-5440). Following Qingdao’s growing international presence, more malls and brand names are moving in. Hisense already boasts Hermes, Prada, Tiffany and Cartier, while Wanda Plaza is home to mid-range Uniqlo and Zara. Prices are no cheaper here unless the brand uses one of the local factories, which specialise in jewellery and shoes. If the bright lights and price tags of shopping malls don’t have the ring of authenticity, try Hairun Silk Store at Hairun International Business Hotel (tel: [86-532] 8666-9566) for good quality Shangdong silk. Jimo Market on Jimo Lu is a courtyard shopping area set in traditional-style Chinese buildings with more than 1,300 stalls selling everything from buttons to ball dresses, and a host of fake goods all vacuum packed in clear plastic. Explore for fun and to pick up some cheap souvenirs, but shops close early, at around 5.30pm. If still craving more of the same, head to the Taidong Night Market that, usefully, starts at 5.30pm and lasts until about 10pm. Those seeking the trendiest threads on their Qingdao shopping spree should head to Zhongshan Commerce City. It isn’t the most inspiring name for an underground shopping mall, but at 113 Zhongshan Lu, it is one of Qingdao's oldest underground shopping streets, stretching eastward to AnHui Lu Park. Find the hottest fashion and haggle away. Slightly cheaper but the same deal (and a less misleading name) can be found at Long Shan Underground Shopping Mall. A little out of the way, west of the main entertainment areas, Changle Road Antique is well worth a visit for the myriad independent antique and second-hand stores. Take a Mandarin-speaking guide if planning to buy. That’s the long and short of Qingdao shopping. At the outskirts of the city and serving business and corporate guests who need good access to the airport is Holiday Inn Parkview. At the forefront of Holiday Inn’s rollout of its brand new image, and five minutes from the airport, the property is convenient for quick stopovers, providing one of the only free airport pick-up and drop-off services. A free nightly shuttle to central sister property, Crowne Plaza, leaves at 6.30pm and returns at 10pm. Next door Century Park breaks up the swathes of pink residential housing and 3,000 factories, and is perfect for a morning jog. Holiday Inn’s new image is squeaky clean and smart, with the atrium-style lobby’s light-wood minimalism extended to the 319 rooms. While not trying to punch above its weight, rooms are slick, and tick all the modern-traveller boxes: LCD TV, Broadband access, laptop safe, bath and shower combo, large windows, choice of hard and soft pillows and deep carpets. There are ten meeting rooms and a 900-capacity pillar-less ballroom for on-the-hoof conference calls or more substantial gatherings. English speakers may struggle with more complex demands. The hardware is in place but software issues still remain. Still in Chengyang, a little further towards the city centre but still ten minutes drive from the airport, is the 420-room Doubletree by Hilton. Attractive browns and creams give a light business touch to 35sq m rooms, which offer Broadband access, LCD TV, iron and ironing board, laptop safe, and Hilton’s signature bed. A glass wall separates the bathroom, which has a rain shower and Crabtree and Evelyn amenities. A spa and large conferencing facilities round out the facilities. With the passage of time and improved English language capabilities, asking for a complimentary Doubletree cookie will get even easier. Four Points by Sheraton opened in 2011 just three kilometres north of the airport, beside the Qingdao Agricultural University and the Qingdao University of Science and Technology. Part of Powerlong City Plaza, with a retail mall, cinemas and an entertainment square, its 303 bright and comfy guestrooms, health club, three restaurants and lounges (including local Qingdao and Korean cuisines) and almost 2,000sq m of meeting space, offer all the simple pleasures we’ve come to expect from the brand. 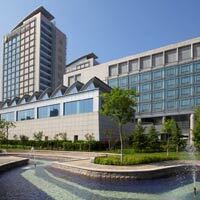 Topping the list of the best new Qingdao business hotels (with a strong leisure appeal) is Hyatt Regency Qingdao. Opened in 2013 on Shilaoren Beach in eastern Laoshan District (closer to the airport than the downtown hotels), Hyatt Regency Qingdao calls itself North China’s first five-star urban beachfront resort. Immediately impressive, the lobby is swathed in marble and contemporary sculptures, with ocean views providing a dazzling backdrop. Down the spiral staircase from the lobby to beach level, Market Café buzzes with chef action at multiple open kitchen stations and is Qingdao’s hottest spot for Sunday brunch – complete with lobster and free-flowing Moet, darling! On a balmy day, the best seats are on the alfresco terrace with lawn and beach views that feel almost Balinese. The ultra-popular Donghai 88 serves Northern Chinese cuisine, including their signature Peking duck and local seafood specialities in an evocative mod-China setting, complete with fishtail lanterns and red Chinese drums. All 439 of the spacious (42sq m and above) citrus-tinged guestrooms feature panoramic ocean or beach views, and windows that, hallelujah, open a crack to let in the salty sea air. Mod-cons in all rooms include 42-inch TVs with cable/satellite programming, an iPod dock, bedside controls and complimentary high-speed WiFi. Marble bathrooms feature a full-size tub, rainforest shower and separate toilet, plus groovy glass walls that become opaque at the flick of a switch. It’s worth splashing out on Regency Club privileges for access to the 21st-floor club lounge with a private rooftop terrace, perfect for enjoying their complimentary sunset happy hour tipples. A lovely Qing Spa, 25m beachside indoor pool and 1,840sq m of event venues are also available. Mark this down as a Qingdao corporate meetings hotel. Staking out the space in between coast and airport in the growing CBD spread, Le Meridien is part of a mixed-used complex comprising a 348-room hotel, Wanda Plaza shopping mall, a cinema, apartment residences, an office tower and a conference centre. Good-sized 40sq m rooms and 80sq m suites include a 37-inch plasma TV, Internet, rainshower and separate bath in slick modern surrounds. 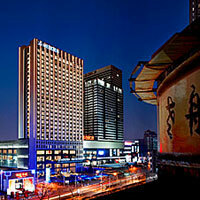 This is a bright and cheerful hotel that ranks among the best Qingdao business hotels on our review. Right on the coast, neighbouring the Olympic Sailing Centre, InterContinental Qingdao’s previous incarnation was the 2008 Olympic Village. As a result, the four-tower hotel is vast, with 438 rooms and an impressive lobby with more than enough nooks, water features and design flourishes to keep a small child, or jetlagged businessman, entertained for hours. The hotel also boasts two yachts, docked in the marina and available for hire. Rooms are not for the technologically faint-hearted. Everything is mechanised, from the curtains (bathroom window included) to the city guide available on your 42-inch swivel IP television. Bathrooms are large and spoiling with separate bath, rain shower and British-brand Natural Products toiletries. Practicalities are not forgotten amidst the gadgetry – you’ll find an iron and ironing board, small safe with power, Bose sound system, and WiFi (charged per day). Deluxe Ocean rooms have unadulterated views over the marina and Qingdao’s miniature opera house and lighthouse. If pushing the proverbial yacht out, two Aqua suites have outdoor terraces and Jacuzzis overlooking the Yellow Sea. The centrepiece of the Club Lounge is its window, which affords the long room floor to ceiling views of Qingdao’s coast. Facilities include the city’s only in-hotel wedding chapel, a 478-capacity auditorium, 600-capacity ballroom and 18 function or meeting rooms. Set further back from the beach, Crowne Plaza has been a Qingdao hotel stalwart for over a decade. The hotel is well-placed in the middle of the entertainment district close to Hisense and Sunshine Plazas, and also has its own small designer brand enclave, Brise Marine, offering Louis Vuitton, Emporio Armani, Bang and Olufsen, and Strellson. Room décor is classic and comfortable, with 388 rooms, including 178 suites, in cream and beige. Standard rooms start from 26sq m (deluxe is 39sq m) and all include a “master cabinet” – a bedside table with light controls and sound system, a small safe, LCD TV, fax machine, Broadband, coffee and tea facilities, iron and board, and in the bathroom, hairdryer, scales and a bathtub. Crowne Plaza’s main draw is its service. Long serving staff and a helpful concierge speak good English and are known for a service that goes beyond the expected level. Also well-regarded in the hotel is Café Asia, one of six restaurants, which has an open kitchen buffet featuring Brazilian, Indian and Mongolian cuisine. The comprehensive in-room business facilities and access to four ballrooms, five function and nine meeting rooms makes Crowne Plaza a top choice among Qingdao business hotels. Just along the road from Crowne Plaza is Copthorne Hotel Qingdao, which offers four-star accommodations in 455 basic rooms with free WiFi, small LCD TV, and large safe. The hotel caters largely to groups. Staff may struggle with English-speakers. The Wyndham Grand Qingdao (formerly a Kempinski that opened in 2012), enjoys a beachfront location overlooking Silver Beach, 30 minutes south of downtown Qingdao. 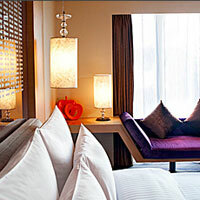 Fresh, contemporary rooms start at 42sq m and are dressed in light woods, amber hues and artful feminine flourishes. Flatscreen TVs, laptop-size safes and bathtubs come as standard. Rooms overlook the beach or cityscape and also feature private balconies where you can relish the fresh sea breezes. The12-year-old Shangri-La Hotel Qingdao – offering a massive 696 rooms across two hotel wings – got a swish update in 2011. The Valley Wing is the pick, with its vertiginous ceilings, soaring Chinese fabric mural, blown glass chandeliers and a smart, attractive burnished gold colour scheme. Décor in the guestrooms is sumptuous in gold and redwood with antiques, high ceilings, 42-inch TV, laptop safe, iron and board and large sofa. Bathrooms come with twin vanities, a second LCD TV, large rain shower and L’Occtaine toiletries. The 500 City Wing rooms are slightly smaller, starting at 37sq m, but have benefited from a much-needed upgrade. All rooms feature complimentary high-speed Internet, indulgent beds and city or ocean views. Dine at funky Café Yum, designed by Japanese Super Potato or meet in the 2,000sq m pillar-less ballroom. Shangri-La’s signature service is the stand-out feature of this established hotel: “Over 100 staff have been in service the whole 12 years [Shangri-La Qingdao] has been open” says Sunny Zhang, Director of Communications, celebrating her own tenth anniversary at the hotel. Shangri-La – the oldest and still one of the most impressive, rounds off our review of Qingdao’s top range international business and leisure hotels. This is a good Qingdao conference hotels choice and a steady business traveller favourite. While local five-star hotels in this area may not carry an international brand name, the staff is often proficient in English, and superbly welcoming to foreigners. The Seaview Garden Hotel Qingdao was a favourite of the British Sailing Team when they stayed for the 2008 Olympics and as a result has seen many pretenders pop up in the surrounding area. We spotted Seaview Hotel, Garden Hotel and even Seaview Garden Hotel, so make sure every word is in place before making a booking. The real McCoy Seaview Garden Hotel Qingdao is a complex of buildings of varying age and distinction, overlooking the Yellow Sea. European-style architecture is very “ancient Greece” with lots and lots of marble, statue bedecked fountains and sweeping staircases, and some Chinese dark wood thrown in for good measure. The effect is not altogether bad. Choose from “Guests Building” and “Distinguished Guests Building” and 198 rooms. The structure has been a hotel for 20 years, with the newest block built in 2006. This houses 71 rooms with “Distinguished” on the fifth floor and “Executive” (40-80sq m) on the ninth. Internet and fax is free, as is an endless supply of green tea. In room find a small safe, glass working desk, CD player, iron and board, LCD TV, separate bath and hairdryer. We recommend booking the top floor for the unusual sloping roof and window, plus good views. Haiqing Hotel, even closer to the beach, and rising up from the sea front, has four buildings, two of which are connected by a glass walkway. The older, mid-range offering has rooms around two atriums, which contain a “beer garden” (complete with lurid green carpet) and a classic Chinese teahouse. Rooms are simple and comfortable, with a separate lounge area crammed with sofas, a compact bathroom (some with bright gold glitter sink), box TV, bath and shower combo, and non-electric square safe. Internet is free. Moving on to A building is like stepping into a different hotel – staff even wear different uniforms. Modernity is spelt out in bright white marble and oversized chairs, with not one, but two sweeping staircases. Large rooms have pale, IKEA-like furnishings, good-sized bathrooms with black tiled floors, free Internet and a small balcony. In some rooms the work desk has been placed directly below a large LCD TV. 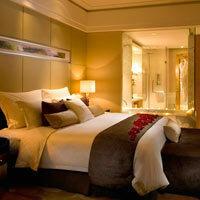 The “his” and “hers” bathrobes are a neat touch, and the open bedside wardrobe lends a resort feel to the room. Building A also hosts a small Japanese restaurant, and a good Indian restaurant called Yamuna. An Olympic hop, skip and jump into the tourist fanned flames of eastern Qingdao and you’ll find a whole host of local hotels. There are the bizarre, like the bright purple, 51-room Vienna Hotel close to Qingdao city landmark May Fourth Square, and Music Square with its statue of Beethoven (the good citizens of Qingdao seem to have a thing about him). The grand, old-world Prince Hotel on Taiping Road enjoys one of the finest locations, with views of Zhangshou Pier. Named after Prince Heinrich, the hotel has a century-long history, originally built in 1899. It has been renovated since then, and rooms are still very European with balconies and lots of chintzy wallpaper. A fascinating local, independent hotel that once housed Mao Zedong’s security personnel, is The Castle Boutique Hotel. The 50 modern rooms are spread over three main buildings: flagship Blue Castle, all-suite Red Castle and standard-room Green Castle. With design splashes fairly soaking the place, furry cushions, furry lamps and lots of monochrome shouldn’t distract from the large, comfortable rooms with LCD TV, Internet, minibar and lots of modern art and artefacts on the walls – and floors. The Castle Boutique Hotel heads the independent hotels for style and interest, but start stretching those pockets as high-design doesn’t come cheap. If a stay is out of reach, visit the Coffee House or one of the restaurants for Hong Kong-style hotpot or Japanese cuisine. 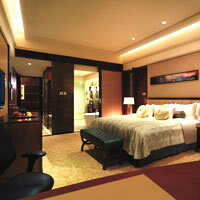 There are scores more local Qingdao business hotels with service and style ranging from class to crass. Take your pick. Time will tell if Qingdao turns out to be more than good weather, great seafood and fresh beer. But at Rmb5 a pint, who’s complaining? And that’s the A to Z of our Qingdao fun guide for families and business travellers in search of a small corporate meeting submerged in lager. Room rates may be subject to a 10-15 percent service charge. The International Beer Festival runs for 16 days in August and exact dates change yearly. Qingdao plays host to many more festivals, from the “Oriental Cherry Fair of Qingdao” (mid to late April), to the "Love of the Sea Ocean Festival” (end of June through early July), or the “Daze Mountain Grape Festival” (September). The exchange rate is around US$1=Rmb6.21. Money can be changed at hotels or banks only. Pick up a copy of free bilingual magazine Red Star (www.myredstar.com) or visit the comprehensive website That’s Qingdao (www.thatsqingdao.com) for the latest goings on. Any room rates here are for rule of thumb only. Hotel rates change on a daily basis. Check with your travel agent or online for the best available rates (BAR). In general expect prices during the low season to range from around Rmb500-Rmb600 at family hotels and boutiques to around Rmb1,000 plus at higher end five-star establishments. Copthorne Hotel Qingdao. 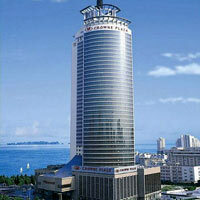 Tel: [86-532] 8668-1688, fax: 8668-1699, (e-mail: info@copthornehotelqingdao.com or www.millenniumhotels.com). Crowne Plaza Qingdao. Tel: [86-532] 8571-8888, fax: 8571-6666, (e-mail: cpqingdao@public.qd.sd.cn or www.ihg.com/crowneplaza/). Doubletree by Hilton Qingdao. 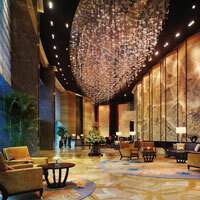 Tel: [86-532] 8098-8888, fax: 8092-8666, (www.hilton.com.cn/doubletreeqingdao). Four Points by Sheraton. Tel: [86-532] 6696-8888, fax: 6696-8808, (e-mail: gsc.chengyang@fourpoints.com). Haiqing Hotel. Tel: [86-532] 8596-9888, fax: 8596-6688, (e-mail: qdhaiqing@qdhaiqing.cn). Holiday Inn Parkview. Tel: [86-532] 8096-6888, fax: 8096-5800, (www.ihg.com/holidayinn/hotels/us/en/qingdao/). Hyatt Regency Qingdao. Tel: [86-532] 8612-1234, fax: 8612-0600, (qingdao.regency.hyatt.com). InterContinental Qingdao. Tel: [86-532] 6656-6666, (e-mail: qingdao@interconti.com or www.ichotelsgroup.com/intercontinental/en/gb/locations/qingdao). Le Meridien Qingdao. 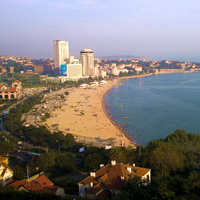 Tel: [86-532] 8501-7506, fax: 8501-7508, (www.lemeridien.com/qingdao). Prince Hotel. Tel: [86-532] 8288-8666, fax: 8287-0929, (www.zhanqiaoprincehotel.com). Shangri-La Hotel Qingdao. Tel: [86-532] 8388-3838, fax: 8388-6868, (e-mail: slq@shangri-la.com or www.shangri-la.com/qingdao/shangrila). The Castle Boutique Hotel. Tel: [86-532] 8869-1111, fax: 8288-1310, (www.thecastle-hotel.com). Vienna (Weiyena) Hotel. Tel: [86-532] 389-6688, fax: 387-5169. Wyndham Grand Qingdao. Tel: [86-532] 5888-6666, (www.wyndham.com).